The Holidays Are Coming. . . Are Your Sockets Ready? As you finish buttoning things down for winter in your community, make sure you are ready for holiday decorations. 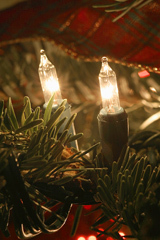 This is a good time to check electrical connections and wiring for any lighted displays you plan to install to brighten the season. All too often we get a rush of requests for repair work or upgrades just before the holidays after workers discover problems when they try to turn on holiday lights. Here’s a quick checklist to run through now so you can get your repair or upgrade requests in before the rush. If you identify needed repairs or upgrades on Consumers Energy streetlights, call 1-800-477-5050 to get your work scheduled. By planning your work early, you can help ensure your community has that festive glow this holiday season.